N A I L S B Y J E M A: Cute Halloween Ghosts Mani and GEL PEN ANNOUNCEMENT!!! Cute Halloween Ghosts Mani and GEL PEN ANNOUNCEMENT!!! I will be selling the gel pens I use for people who can't find them overseas through email order only. Email me at nailsbyjema@gmail.com to enquire about pricing. Prices will depend on how many you order and where you live as I will obviously need to include postage costs onto your order. 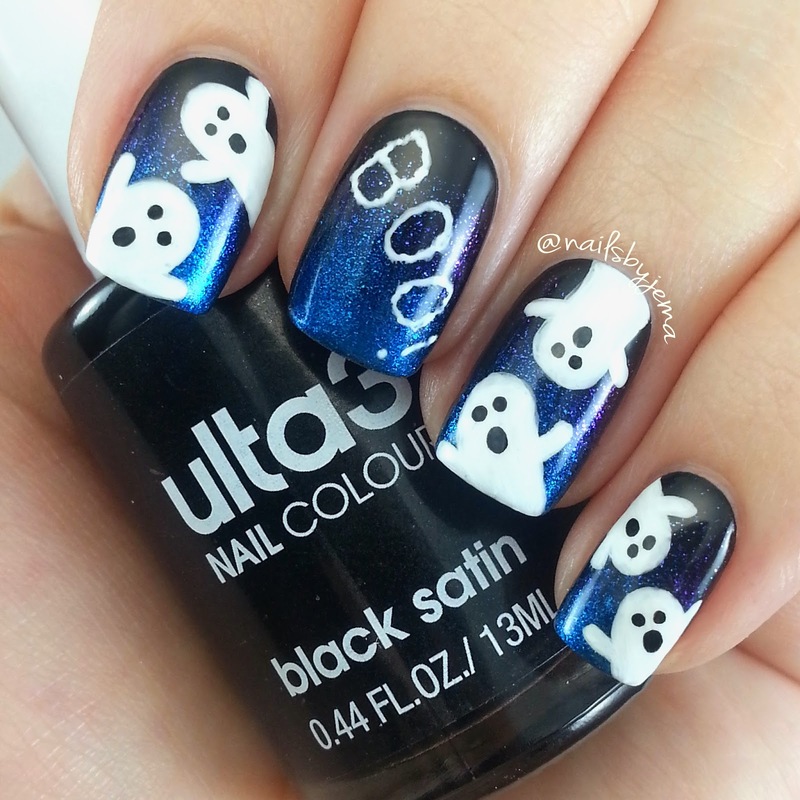 This one is a super easy gradient with hand drawn ghosts and the word BOO written with my Uniball Signo gel pen. The ghosts were painted with acrylic paint and my black Uniball Signo gel pen used for the faces and white Uniball Signo gel pen for the word 'BOO'. Top coat is the incredible HK Girl Top Coat. I used Ulta3 'Black Satin', L.A. 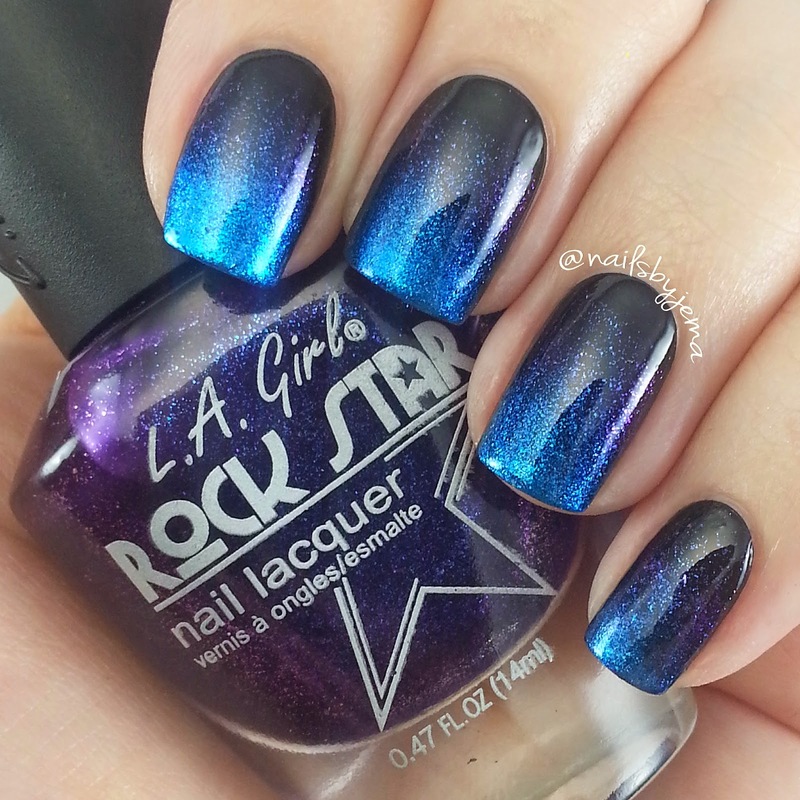 Girl Rockstar 'Groupie' & OPI ' Swimsuit to do the gradient with a make-up sponge. It's so sparkly!! Video Tutorials after the jump! I even managed to film a tutorial for this one. It's actually a really easy and quick mani to do if you have the pens. You can even water the acrylic paint down to make the ghosts more transparent. Just using acrylic paint and my black Signo Uniball gel pen with a small nail art brush from eBay. Song is the incredible Sam Smith - Stay With Me. The most pointless tutorial ever!! I 'squiggled' the pen on my nail to get a messy look to the letters to make them look SPOOOOOOOKY haha. Song is Taylor Swift ( aka my favourite person ever) 'Out of the Woods'.